It's about about the newest technology! From brain controlled interfaces to the newest pen with lasers in it, you'll find all of the coolest tech here. If you read the title, then you know what the hottest new idea out there is, wireless electricity. I don't know about any of you, but every wireless thing I own has made life easier. This has to be the century of wireless technology. We came in with cordless phones and are planning to eliminate the mess of wires all together. Cordless controllers for gaming systems was a huge hit as well. Cords to different controllers would tangle while you weren't there just to cause you the frustration of trying to untangle all of the cables going to each controller. But, the mess was still there. Countless things we use are still plug into seemly rare electrical outlets around an entertainment system. Who hasn't had a mess of wires in your living room half of which you didn't even know what went where? Can you imagine a place without any wires? A day you don't have to spend looking for the charger you know you left at home? You can find the article right here. What happens is the electricity is first turned into a concentrated laser beam. It is then shot to a solar panel that converts it back into electricity. 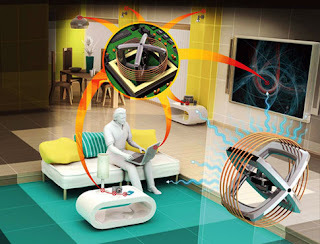 They call it "WiTricity" wittily combining wireless and electricity. It can currently generate 1.5 watts of power which is enough to power a speaker or a small LED screen from about ten meters away, but not enough for any high tech stuff. Don't worry, they are still working on perfecting this wonderful piece of technology to make it capable to power entire buildings. This new technology with be shown to the public for the first time at the International Consumer Electronics Show in Vegas this spring. Wow was my first reaction to reading this article. I know there have been many times I've left my phone cable at home when I've left for vacation. I wouldn't feel bad if someone else had the same charger as me, but you know how those phone companies are. None of them seem to use the same charger. Everytime you get a new phone you have to get a new charger to go with it even if it's from the same company. Wireless electricity technology would eliminate all those problems. It sounds like something from some crazy science fiction movie, but it's real. Sure, solar panels are not the most effective way of utilizing electricity yet. With a little bit of research, I think this could be as common as electricity within the decade. Of course, there is also the idea that the laser may cause a severe raise in temperate since that is how solar panels are powered. This issue has not been addressed by the company yet so I don't know what to really say about it. It would still be worth the increased temperate to use wireless technology, especially in the icy cold of the winter. People are also afraid that electromagnetic waves created by this device will cause cancer, but scientists claim that once a person walks into the beam, it is immediately destroyed. The interference will cause the beam to shut down only to be restarted once you have moved out of the way. All in all, I think this is the kind of innovation that needs to be presented more often. We always here stories of older people talking what life was like before the Internet, TV, and cars. I believe the idea of plugging all your electronics will become a story just like walking 15 miles to school in the snow uphill both ways; no one is going to believe it. I bet everyone who reads this blog watches television a good amount. Anyone who watches TV notices the obscene amounts of advertisements in between what you actually want to watch. There is also a constant stream of cell phone commercials. They talk about the newest BlackBerry that also happens to have a touch screen which links you to everything you'll ever need on your phone and much much more. You can go online, take pictures, record videos, play games, keep your schedule, check and organize your e-mail, send voice messages watch TV, and they can even call people! But there is one thing all the phones in the American market lack, the ability to enlarge the screen for easier viewing of videos and pictures. In this area of technology, America is far behind Asian countries that are able to use their cell phones as a credit card and convenience stores in addition to other cool things. Needless to say, we are far behind even though many of those features such as the feature that allows you to send an avatar when you call people seem entirely pointless. All the money handling capabilities of these phones seem a tad bit scary. Just having access to all your financial data available on such an easily misplaced item seems too risky. I’ve lost my phone a few times before and never was too worried about finding it since my phone contained nothing extremely personal or dangerous. 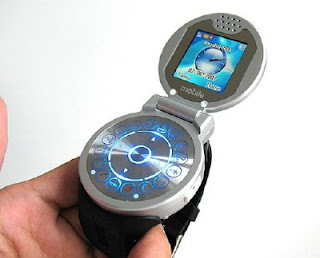 But, one of the newest phone ideas out there could be coming to the states after a trip around Asia. Samsung has come out with a new phone called the Show and Logic also created the same type of phone called the Bolt. The unique thing about these phones is that they have a built-in projector. The projector is made by Texas Instruments utilizing their DLP technology that is now used in some movie theaters to enhance video. The screen can reach a beautiful picture at the good size of 50 inches; the size of a big screen TV! I don't know about anyone else, but I think this is awesome. I always am taking crazy pictures and videos with my friends. When I go to show them to multiple people, problems arise. Elbows are being wedge between people to try to get a closer look before a fight breaks out over who should be the closest to the video only to be resolved by my agreeing to view the same media a multitude of times. So often have I wished I could just put it on a television for all to see. Alas, that would be another cord I wouldn't carry around with me anyway defeating the entire purpose of purchasing it in the first place. The convenience to create a larger screen on any flat surface appeals to me. It just makes sharing media quicker and easier which is how every piece of technology evolves. The biggest problem I see is cost. Few people are going to want to hand out the few extra hundred just to get a projector in their phone. It may be a good investment for business people who are constantly giving presentations, but not a good one for the common person. Plus, DLP technology is fairly fragile. I’d be worried that if I simply had the phone slip out of my pocket and onto a hard floor, the projector would be broken. Don’t forget that the projector would eat up all your battery life just to turn on. It better come with extra batteries for those giving presentations with their phone; they don’t want to have to stop a presentation early and just go by memory only because the battery died. All in all, a projector phone could be a great idea if they manage to cut the cost to produce it while keeping reliability intact. I don’t see how it could become mainstream, at least in America, anytime soon. We may have to wait years before this becomes available and affordable to the American public. The people willing to use their phone to manage finance will love this addition to the countless things their phone is already capable of doing. Cox Communications, the third largest internet service provider (ISP) in America, is hitting BitTorrent users with slower downloads. But they are not the only ones wishing to start a war against torrent users. Even ISPs across the globe, such as Eircom in Ireland, are fighting in the battle. The internet was originally created to help connect people that live far apart and have them share information. With the evolution of the web, more and more information has been uploaded; especially copyrighted files. Music, movies, and applications are just among a few of the illegal files that are exchanges through what are called peer-to-peer (p2p) networks. 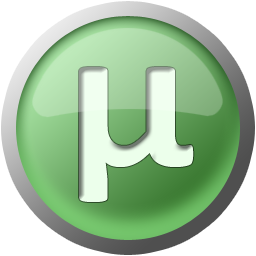 Programs such as Limewire provide a means of connection between a computer trying to download a file and other computers that have that same file. Files shared through p2p networks that are copyrighted are completely illegal. It is unfair that, while some people actually pay for a movie, others just go online and download it completely free of charge and without leaving the comfort of their chair. Not only that, but if p2p networks become as mainstream as the internet itself, the billion dollar entertainment industry will suffer. Thousands of houses are under the same Comcast connection in order for the company to save money. Comcast created a front against p2p because households running such programs would occupy a good amount of bandwidth denying other households access to the internet. They proposed the idea of dividing up bandwidth between all households they provide internet equally to make it so p2p networks on one connection cannot boot another computer off the internet because the p2p program pushes Comcast’s limits to the max. When the FCC took a look at Comcast’s plan, they deemed it illegal since they were hindering the sharing of information on the free air. Sharing files doesn’t truly hurt anyone. The only thing that it does is lower the profits of people making multi-billion dollars. Pirating movies and music is the same as borrowing it from a friend; you watch the movie or rip the music files to your computer. Pirating is unstoppable because of how the files are sent across the internet. The files are broken up into small pieces called packets. The packets are sent to the computer download the file from various computers. Those very same computers sent the packets through different pathways to get to the computer downloading the file. The packets stay separate until all of them arrive at their destination where they are pieced together by the p2p software. Because the internet was created to share information and files, nothing is going to stop p2p networks. The people that created the programs are some of the best programmers in America and will manage to find ways around any wall that is put up in defense. The government should just forfeit all its fruitless attempts to block illegal file sharing. There is nothing they can do without invasion of privacy. It is all harmless fun that only hurts the rich. While browsing the web, I found an article about the changing military scene. Whether we like it or not, technology on the battefield is changing drastically. As the Navy's slogan states, they are working to unman the front lines. There are a variety of different Unmanned Aerial Vehicles (UAVs). Military officals are concerned with the lose of the most valuable resource they have; trained men. Usually used for spying, UAVs are small aircrafts that wouldn't even be large enough to hold a person let alone controls. And they do save lives. Because they are drastically lighter and smaller, most military equipment has a very hard time detecting, locking-on, and destroying this small aircrafts. Even president Obama is pushing the idea of futhering this new technology. But UAVs aren't the newest thing out there in the military world. With every new leap in military technology, there must always be a counter to this new discovery. This new discovery is the perfect counter to the spy planes. What they do is mount a giant laser to a Humvee and use the auto targeting to lock-on and wait until the target is within range to be completely obliterated by the massive laser. Sucessful field tests have been done at long ranges. The range and the size of the target have not be disclosed to the public yet. They may even be working on a laser that can destroy fighter jets as well. Most of you reading this are probably saying “Wow that’s awesome! Now we can have automated defense and recon!” And yes this is good. Robotics has taken a huge leap this century. The only problem is that people do not know where it will end. Japan has robots that look and act like humans. There is a youtube video of a particular robot that looks like its creator here. The difference between the robotics in Japan and the robotics here in the United States is we focus more on created robots for our military while they just create robots for personal entertainment. The concern with robots in military is not that they will replace humans. The problem resides in wondering at what point will the military say “We have enough robotics.” Most of us have seen the movie Terminator. The army itself is entirely made out of unstoppable robots. If our government manages to perfect the idea of these robots, they could enslave the world. It could end up something along the lines of what happened in the movie I, Robot. Not the evolution aspect of the robots but the fact that the robots could be used to force people to do stuff and put people into slavery.